Of the blues that were most closely listened to in the early 60s by young guitarists such as Eric Clapton, Keith Richards and Jimmy Page, many were by Howlin’ Wolf, and, of those, not a few featured a guitarist, then still young himself, who could steal a scene even from so charismatic a performer. 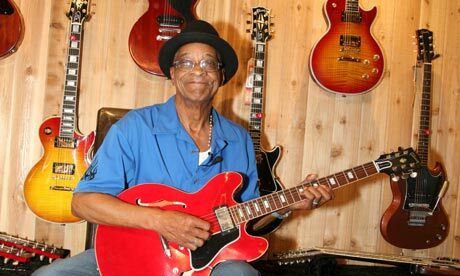 Hubert Sumlin, who has died aged 80, thus became one of the most revered of blues guitarists, and in his later years younger musicians practically lined up to play with him or have him guest on their recordings. Sumlin was born near Greenwood, Mississippi, and grew up across the river in Hughes, Arkansas, where he took up the guitar as a child; by his teens he was playing for local functions, sometimes with the harmonica player James Cotton. The first time Sumlin saw Wolf in action, as he told Living Blues magazine in 1989, he was too young to get into the club, so he climbed on to some Coca-Cola boxes to peer through a window; the boxes shifted and Sumlin fell into the room, landing on Wolf’s head. After the gig, Wolf drove him home and asked his mother not to punish him. “I followed him ever since,” Sumlin said. At the time Wolf was working with the guitarists Willie Johnson and Pat Hare, but Sumlin was occasionally permitted to sit in. Then, in 1953, Wolf left the south for Chicago, where he would develop his music on the bustling club scene and in the studios of Chess Records. In spring 1954, he sent for Sumlin to join him, and soon afterwards the 23-year-old guitarist was heard on records such as Evil and Forty-Four, and a couple of years later the sublime Smokestack Lightning, though for a while he played second to more experienced guitarists like Johnson and Jody Williams. Wolf died in 1976, and Sumlin, whom the older man regarded almost as a son – indeed, on the funeral programme he was named as such – took the loss very hard. He dropped out of music for a while, but returned to shape a career for himself, at first deliberately moving away from Chicago to Texas, where he left an impression on the Vaughan brothers, Jimmie and Stevie Ray. Over the next 30-odd years he toured extensively in the US, Europe and Japan and made numerous albums for various blues labels, gradually revealing, and never quite overcoming, the problem that he was at heart an invaluable sideman rather than a natural leader. His conversational singing was seldom strong enough, or his own material striking enough, to grip the listener for the length of an album. Perhaps aware of this, some producers solicited instrumentals, on acoustic guitar as well as electric, but unplugged he had less to say, though the quiet colloquy of his guitar and John Primer’s on the 1991 album Chicago Blues Session had a charming back-porch serenity. Nonetheless, on Wake Up Call (1998) he seemed to rediscover the verve and unpredictability that had made his work with Wolf so exciting, while the sympathetically produced About Them Shoes (2005) skirted the issue of his coarsening voice by focusing on his guitar, in settings buttressed by admirers including Clapton, Richards and Levon Helm. Sumlin was nominated for a Grammy four times, most recently in 2010, and was placed 43rd in a 2011 Rolling Stone poll of the 100 Greatest Guitarists of All Time. He had a lung removed in 2004. His wife Willie “Bea” Reed, whom he married in 1982, died in 1999.